We will work with you to resolve the issue as quickly as possible. Good condition. RD # 986935. BURLINGTON NORTHERN SANTA FE. 89 FT AUTO RACK CAR. AUTO RACK CAR / USED / BUT LIKE NEW. AUTO RACK CAR IS AS IS ONLY. ORIGINAL BOX WILL BE WRAPPED WELL IN BUBBLE WRAP. "The Cardinals Train" is one of a series of Con-Cor Limited Edition Collector Sets. These sets have proven to be valuable additions to N-Scale collections - whether or not they are operated - This set is #0001-008503. Con Cor Great Northern Tender. (FOR SALE, AS PICTURED, ARE THREE VERY CLEAN CON COR N SCALE MODELS OF 3)FRISCO BOX CAR NO 18429. NS RD # 171329. NORFORK SOUTHERN. 89 FT AUTO RACK CAR. AUTO RACK CAR / USED / BUT LIKE NEW. AUTO RACK CAR IS AS IS ONLY. ORIGINAL BOX WILL BE WRAPPED WELL IN BUBBLE WRAP. Here are sixteen Con-Cor N Scale Freight Cars: Merry Christmas, Model Railroader, North Pole. Please see my pictures for additional features, and to view all included items. This item has been graded per TCA standards C-6: Very Good. There are several scratches, nicks, and missing or broken parts on these items. The instruction manual is not included. The original boxes are included. Overall condition is Very Good. Manufacturer: Con-Cor. Scale/Era: N Scale. Model Type: Freight Cars. Availability: Ships in 1 Business Day!. CAR #459573. 50' MODERN REEFER -. CON-COR N SCALE ITEM #2010-4. 9" x 2.5" x 6.5" high. Here are Con-Cor N Scale Boxcars & Reefers. Please see pictures for features of each car. This item has been graded per TCA standards C-8: Like New. Check the photos for a detailed look at this item. Overall condition is Like New. Manufacturer: Con-Cor. Scale/Era: N Scale. Model Type: Freight Cars. Availability: Ships in 1 Business Day!. Concor 'N' scale Christmas box car issued in 1984, catalog #8401. It is a 40' steel reefer that is painted white with red ends and a red roof and th ecar number is '1984'. The car is in NEW/UNUSED condition. EXCELLENT CONDITION - No Case - Couplers do not have trip pins. TTGX RD # 965962. SANTA FE Q. 89 FT AUTO RACK CAR. AUTO RACK CAR / USED / BUT LIKE NEW. AUTO RACK CAR IS AS IS ONLY. ORIGINAL BOX WILL BE WRAPPED WELL IN BUBBLE WRAP. Here are sixteen Con-Cor N Scale Freight Cars: Christmas, San Diego, Museum of Science. Please see my pictures for additional features, and to view all included items. This item has been graded per TCA standards C-6: Very Good. There are several scratches, nicks, and broken or missing parts on these items. The instruction manual is not included. The original boxes are included. Overall condition is Very Good. Manufacturer: Con-Cor. Scale/Era: N Scale. Model Type: Freight Cars. Availability: Ships in 1 Business Day!. 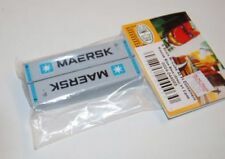 CONTAINERS ARE IN MINT CONDITION, NEVER OPENED, ORIGINAL BOX AND INSERT FROM THE FACTORY. Check out the photos these are very nice cars.T his is from a late friend of mines collection. Here are sixteen Con-Cor N Scale Freight Cars: Weyerhauser, Model Railroader, Christmas. Please see my pictures for additional features, and to view all included items. This item has been graded per TCA standards C-6: Very Good. There are several scratches, nicks, and broken or missing parts on these cars. The instruction manual is not included. The original boxes are included. Overall condition is Very Good. Manufacturer: Con-Cor. Scale/Era: N Scale. Model Type: Freight Cars. Availability: Ships in 1 Business Day!. 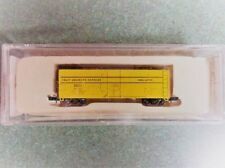 Con-Cor N Scale Union Pacific Auto Rack Condition is Used No Case Shipped with USPS First Class Package. Here are Con-Cor N Scale Pennsylvania Passenger Cars. Please see pictures for features of each car. This item has been graded per TCA standards C-8: Like New. Check the photos for a detailed look at this item. Overall condition is Like New. Manufacturer: Con-Cor. Scale/Era: N Scale. Model Type: Passenger Cars. Availability: Ships in 1 Business Day!. This is an item I bought for resale. It looks in very good condition. It is untested.I do not collect Trains. It is sold in used as is condition. Estate sale item. 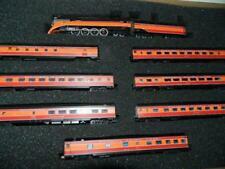 Here are Con-Cor N Scale New York Central Passenger Cars. Please see pictures for features of each car. This item has been graded per TCA standards C-8: Like New. Check the photos for a detailed look at this item. Overall condition is Like New. Manufacturer: Con-Cor. Scale/Era: N Scale. Model Type: Passenger Cars. Availability: Ships in 1 Business Day!. This is an item I bought for resale. It looks in very good condition.I do not collect Trains. It is sold in used as is condition. Estate sale item. Photos are accurate. Unknown age. Box shows signs of handling and stickers. CAR #635603. BN 90' PIGGYBACK FLAT CAR. WITH 40' & 45' TRAILERS. N Scale Con Cor CP Rail Autorack. Condition is New. Shipped with USPS First Class Package. This has been in storage over 25 years. CAR #30275. CON-COR N SCALE ITEM #1735. Here is a Con-Cor 0001-004018 N Scale Lackawanna 5-Car Passenger Set. Please see my pictures for additional features. This item has been graded per TCA standards C-8: Like New. The original box is included. Overall condition is Like New. Manufacturer: Con-Cor. Model Number: 0001-004018. Original MSRP: 79.90. Scale/Era: N Scale. Model Type: Passenger Cars. Availability: Ships in 1 Business Day!. EXCELLENT CONDITION - No Case - Couplers do not have trip pins - Custom machinery parts load - Custom weathered. Plastic case has light wear. We will do everything within our power to quickly resolve your inquiries. Local Pickup In Excellent condition. This is a N Scale Life-Like Diesel Power Illinois Central Locomotive This is from a late friend of mines collection. The Locomotive Tested smooth running and looks great. Those are not included as part of the sale unless explicitly stated. Scroll down to view large size pictures. Grading: C-5 Good. (I never did get my layout built, now health problems forces liquidation of my collection.). my loss could be your gain. U- DO'SN SCALE DUMMY LOCOMOTIVES THEY HAVE TRUCKS but no WHEELS OR COUPLERS THEY ARE READY TO PAINT AND DECORATE ANY OLD WAY YOU DESIRE. BLOWOUT SALE !!! CRLE 5023 SOUTHWIND. 0001-603109(01) Twin Stack Container Car, w/ 2 Norfolk Southern Containers. We were the largest Micro Trains dealer on the East coast for 10 years. 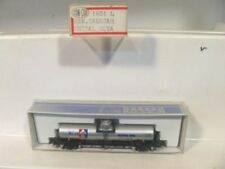 This is an N-Scale product from Con-Cor International Inc.
SLEEPER - FOUR TOTAL CARS. SCALE : N. Happy Hunting and Good Luck! TrainMaster Models is located NE of Atlanta, GA near the Mall of Georgia and is on the Norfolk Southern Mainline. We are a Walthers online dealer. N Scale Con Cor Pa-1 A&b Powered And Dummy!! A powered runs very strong! !